No surprises in the Pie Conference: Boston Cream got, uh, creamed by heavy-hitter Pumpkin. 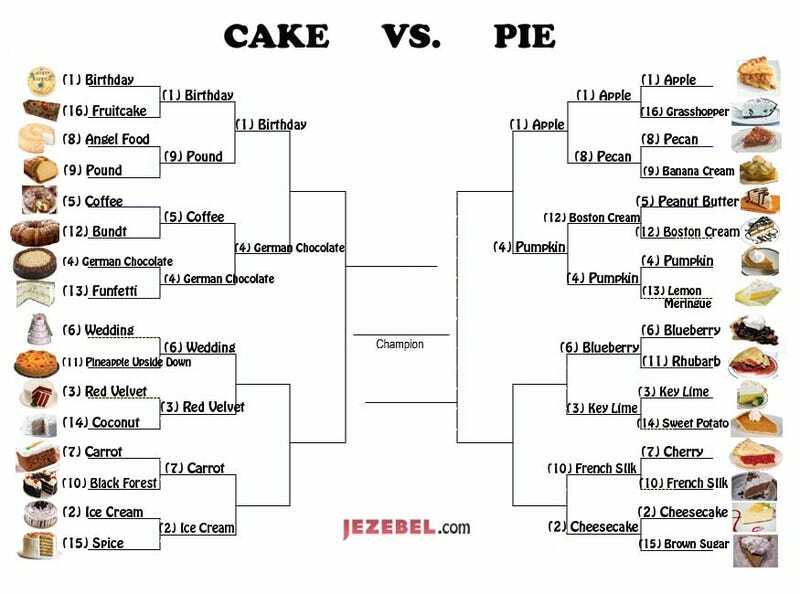 But the Cake Conference was a squeaker: German Chocolate just barely beat Coffee. But today's matchups are, ahem, no cakewalk (I'm on a roll here). We're now halfway through the Sweetest Sixteen, with no upsets. Today, perhaps, everything will change — what's black will be white, what's old will be new. Will the sentimentality of #6 Wedding Cake overcome the bloody deliciousness of #3 Red Velvet? Will the tartness of #3 Key Lime Pie fall prey to the fruity favors of #6 Blueberry? Only you can decide. Voting is below; be sure to scroll and vote in both matchups. Per usual, polls close on 3/31 at 1:55pm EDT. Vote with your hearts, your minds, your stomachs!